We are within a few weeks of James Robert's 3rd Birthday! This year, he is so excited about the milestone- especially know that he understands it is accompanied by cake and candles (a boy after my own heart)! I'm fairly certain that he is most excited about the celebratory nature of his birthday, but I can't help but corral a few items that I know he'll love too. 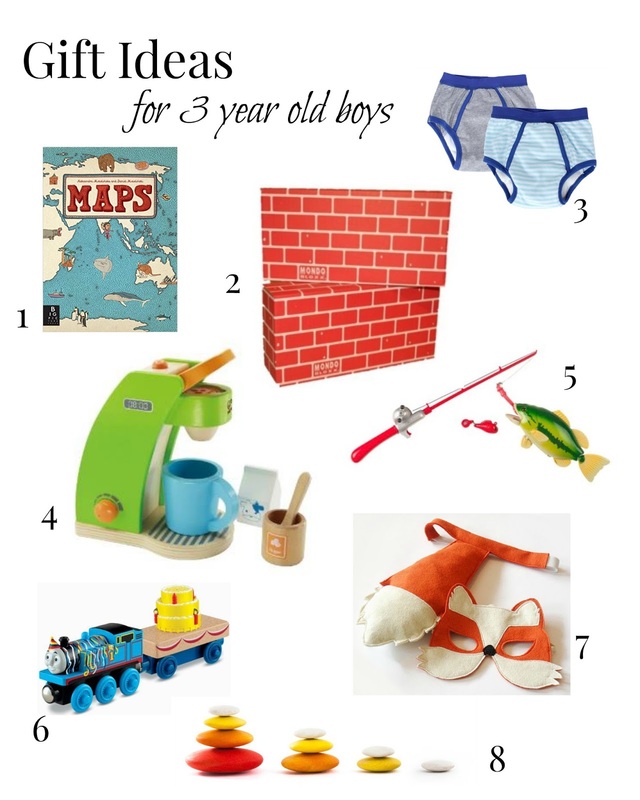 I'll save the nostalgia for another post, but until then, here are some gift ideas for little boys at this sweet age. 1) This book is supposed to be as visually appealing for adults as it is wondrous for kids (thanks Christine). We used to have a large map on JR's wall that he would explore endlessly; I think this book would be a fun way to track where Daddy travels. 2) My niece received these blocks for Christmas and although she is a bit older, they proved to be a hit with the kids of all ages. The fort building, knocking down play is endless. 3) We are in the process of potty training. These big boy undies would be extra special Made of super absorbent bamboo, they are training pants that look like the real deal- brilliant! 4) JR is as obsessed with our Nespresso machine as we are. He asks to make a fluffy everyday; I'd rather him hone his skills on this sweet toy. 5) I don't know if I'll ever be able to get him out of the bath if we get him this fishing rod. 6) We are still in the throws of train mania- in fact, that's the birthday theme requested this year. What's more prefect than a singing Thomas train? 7) Dress-up for boys is just as fun as little girls- something I'm thrilled about as Mom. These animal masks/tails are adorable. 8) All summer long, we skip stones and collect lake glass by the lake. These sorting and stacking toys would be a fun indoor replacement until it's warmer.